"Iran's situation is better than pre-2016 because of high oil prices and the fact that the U.S. is isolated this time," said a European diplomat who asked not to be further identified. Iran emerged in early 2016 from years of global sanctions under a deal with world powers that curbed its disputed nuclear program. But President Donald Trump withdrew the United States from the deal in May, calling it flawed to Iran's advantage, and reimposed far-reaching U.S. sanctions in phases, with the most damaging oil and banking penalties taking effect on Nov. 5. Trump aims to force Washington's longtime adversary to accept tougher restrictions on its nuclear activity, drop its ballistic missile program and scale back support for militant proxies in Middle East conflicts from Yemen to Syria. The other signatories to the nuclear deal - Germany, France, Britain, the European Union, Russia and China - have condemned Trump's walkout from the pact. The EU is preparing a special mechanism to enable payments for Iranian oil and other exports without U.S. dollars, possibly through a barter system. "It will be a difficult period but Iran's economy will withstand it for various reasons," a second diplomat said, "including (the fact of) Russia being under (U.S. and EU)sanctions, Saudi Arabia having its own financial and political issues, and (trade war) between China and the United States." Big power disunity and EU moves to circumvent Trump's sanctions regime have given Tehran a psychological boost - but not dissuaded foreign businesses ranging from oil majors to trading houses and shipping concerns from pulling out of Iran for fear of incurring new U.S. penalties. 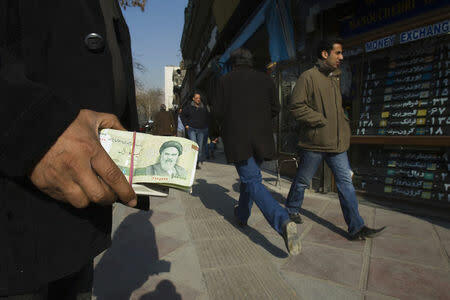 "Tehran is still likely to see a substantial share of its foreign exchange earnings maintained," Andrine Skjelland told Reuters. "This will enable Tehran to continue subsidizing imports of selected basic goods, keeping the costs of these down and thus limiting inflation to some extent." "Oil revenues might decline but (they) will still be enough to run the country," said an official involved in Iran's international commerce. "If we sell our oil for $1 less than market price, it will have tens of buyers." "Despite the rhetoric and attempts to mitigate the downside effects..., uncertainty will remain prevalent for the next 6-12 months," he told Reuters. The International Monetary Fund has forecast that Iran's economy will contract in 2018 by 1.5 percent and by 3.6 percent in 2019 due to the dwindling of oil revenues. But Iranian officials are defiant, citing Trump's isolation in repudiating the nuclear deal, climbing oil prices and Trump's agreement to grant sanctions waivers to eight countries especially dependent on Iranian crude. "Crude prices are rising. Even if Iran's oil sales drop to 800,000 barrels per day (bpd), we will be able to run the economy. But we will send much more than that. Our economy will be far from collapse," said a senior Iranian official. "Our budget is based on oil of $57 per barrel and is now over $75 per barrel." In October, Iran's crude exports were estimated at 1.82 million bpd by data intelligence company Kpler and 1.5 million bpd by another firm that traces Iranian shipments. "Even without the exemptions, we will sell our oil. We will bypass sanctions. We have so many countries that are on our side. America cannot do a damn thing," said a senior official close to Iranian Supreme Leader Ayatollah Ali Khamenei. The rial's weakness has sent prices of some imports rocketing, destroying jobs as some factories using imported parts have folded. Around 70 percent of small factories, businesses and workshops have begun to close down in the past few months due to scarcity of raw materials and hard currency, according to the Iranian state news agency IRNA. Moreover, Trump's sanctions against Iran's financial sector essentially make 30 banks and their subsidiaries off-limits to foreign lenders, undermining its means to facilitate trade.